We have chosen solid breeding quality alpacas with a generous package that reflect a 50% savings to encourage interested buyers at a price that is very agreeable for both parties. 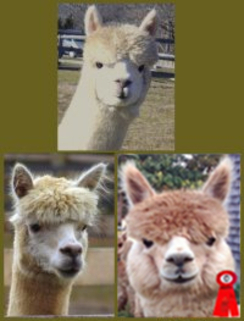 This package includes a lovely alpaca trio. Includes one proven herd sire, IL Tesoro. All animals are well acquainted with each other and would be great for any home! This package includes the animals below. Free transportation to your location within 75 miles of Island Alpaca Farm. Sire, CT Estrada, 8x Champion!